The Aquarium seen from the County Causeway after opening in 1921. 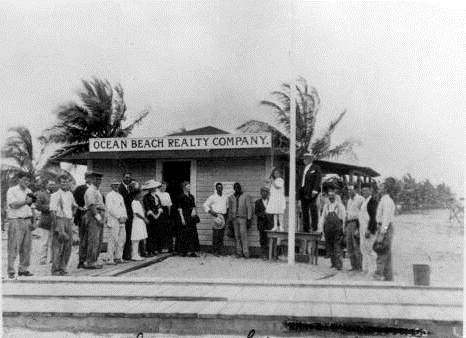 On March 26th in 2015, Miami Beach will be celebrating its centennial. During the celebration of 100 years since incorporation, Carl Fisher will be celebrated as the visionary and builder of early Miami Beach. While Fisher was not alone in building Miami Beach, he was the major driving force behind what Miami Beach became in the first half of the twentieth century. Some of the other contributors to the building of Miami Beach were friends and business associates of Carl Fisher. One of those friends was James Allison. Carl Fisher was a man who never forgot his friends and colleagues. One of his friends was his business partner in building the Prest-O-Lite company, James Allison. Fisher owned one of the first automotive dealerships in the country and Allison had his hands in a number of businesses based upon family connections and his own personal innovations. In 1904, the two men came together to form the ‘Concentrated Acetelyene Company’ which was to create and manufacture the first truly effective automobile headlight. The company was later renamed to Prest-O-Lite when a third business partner left the company in 1906. The lights were not based on electric power, but on acetelyene gas. Cadillac is credited with inventing the electric headlight in 1912. Both Fisher and Allison had begun to amass a small fortune while building their company. However, it wasn’t until Union Carbide bought Prest-O-Lite in 1917 that both men became multi-millionaires. Fisher and Allison would go on to found a number of significant other ventures that live on today, including the Indianapolis 500 Speedway and the Lincoln Highway. If both men chose to retire after their work in Indianapolis in the mid-1910s, no one would have blamed them. Together they had accomplished so much in a relatively short period of time. It was Carl Fisher who decided to live part of his time in Miami. Since the arrival of Flagler’s first train in 1896, Miami had become a very chic destination for the wealthy industrialists of the day. After getting involved with helping John Collins with his bridge from Miami to what would become Miami Beach, the entrepreneur in Fisher couldn’t help but capitalize on the opportunity to build a world class destination resort in sunny South Florida. Fisher had been in Miami since 1910, and he had big plans for Miami Beach with the land he got from both John Collins and the Lummus Brothers in exchange for his financial assistance. Fisher always thought big and he reached out to his former business partners to become involved with his vison for Miami Beach. All of his former associates turned him down, including James Allison. Prior to the sale of Prest-O-Lite in 1917, Allison was in his mid-forties and contemplating retirement. His father and two brothers died in their 40s, and he had already suffered a heart attack at the age of 41. He was able to convince his wife to consider getting involved with Fisher’s dream of building Miami Beach into the “World’s Winter Playground”. In February of 1916, Allison decided to come down and check out Fisher’s development of his grand vision. Although development was not far removed from its inception, Allison saw Fisher’s vision and was very enthusiastic. He decided to participate as a financier, at least initially. Fisher knew that the wealthy visitors to Miami Beach would require entertainment. He planned to provide polo matches, golf and speedboat races. By the late nineteen teens, Fisher’s vision was progressing nicely. It was around the same time, the late nineteen teens, in which hotel rooms on Miami Beach were becoming very scarce. There were only a few places to stay on the beach including Fisher’s Lincoln Hotel, Browns Hotel, The Breakers and several apartment homes. In 1918, Allison’s residence was listed at the Lincoln Hotel. The 1920 census listed James Allison as a guest in the home of John Levi. With such a scarcity of hotel rooms, Fisher and Allison began planning a grand hotel in the late 1910s. The hotel would be called The Flamingo, and it was designed to appeal to the wealthy. It was to be built on the bay side of Miami Beach and it was to be close to all of the activities: polo matches, golf and the speedboat races. Due to a lot of factors, the cost overruns escalated rapidly and Allison decided not to participate any further in the building of the Flamingo. Since his childhood, James Allison had always pictured himself sponsoring a collection of some of the finest fish in the world. He spent a lot of time sport fishing in Miami and he began to develop an interest in tropical sea life. By 1919, Allison began to envision starting a world class aquarium that would serve the dual purpose of providing a research facility to study tropical species and a tourist attraction to visitors of Miami Beach. Aerial view of County Causeway in 1920. Allison pitched his idea to Fisher and to some Miami County Commissioners. Everyone was very excited about the possibility of providing a world class tourist destination on Miami Beach. There was talk about building the aquarium on the south side of the developing County Causeway (now the MacArthur Causeway). The County Causeway was proposed, and partially funded, by the Lummus Brothers, in 1917. It was supposed to be fully funded and completed sooner, but the Causeway did not get completed until February 17th, 1920. The main delay in the completion of the bridge was the United States participation in World War I.
Allison favored a parcel of land that was just north of the causeway in order to capitalize on the traffic patterns expected once the County Causeway opened. Given the available activities of the day, he figured that traffic would go north and it was more likely that visitors would notice and stop at The Aquarium as they approached Miami Beach if it were located on the north side of the causeway. James Allison had hoped that The Aquarium could be completed in time for the 1920 tourist season. Given his start time, his hope was very aggressive. He not only needed the facility designed and built, he would need to put together an advisory committee, hire a director and begin collecting tropical sea creatures for exhibit and study. Allison’s friend, Jack La Gorce, recommended Louis L. Mowbray for the job of director of The Aquarium. Mobray had a fine reputation of building and running aquariums. He started and ran the Boston Aquarium and was assistant director of the New York Aquarium. Allison was also able to convince a number of high profile men to join his advisory committee. Some of the dignitaries included Alexander Graham Bell, the president of the National Geographic Society, secretary of the Smithsonian Institution, the U.S. Commissioner of Fisheries, Carl Fisher and several other prominent and accomplished gentlemen. Construction of The Aquarium was well under way by January of 1920. It was hoped that the building would be completed by February in order to open during the 1920 winter season. However, there were several events that delayed the completion of the project. Given the size of the Flamingo Hotel project, which was being constructed at the same time, there was a log jam of ships with building materials waiting to be offloaded in Miami. By April of 1920, the building was progressing slowly. The interior tanks were just completed and it was clear that the 1920 tourist season would be missed. Allison shifted his attention to have the grand opening on January 1st of 1921. A view of The Aquarium fish tanks. On July 3, 1920, one of the workers noticed a leak and determined that it was from one of the water tanks. Shortly after this discovery, the tank, which consisted of 15,000 gallons of water, collapsed. The force of the water caused damage to some of the support pillars and created a huge mess. The fish in the collapsed tank had to be quickly collected and put into one of the other operating tanks. The failure was due to the design of the tank not being followed properly. In the fall of 1920, Louis Mobray and Captain Charlie Thompson began gathering specimens for The Aquarium. There was plenty of unique marine life that was trapped and loaded into the holding tank on The Aquarium’s fishing boat, the Allisoni. As the end of 1920 approached, both The Flamingo Hotel and The Aquarium were nearing completion. The grand opening for The Flamingo was scheduled for New Year’s Eve and the opening of The Aquarium was to take place on January 1, 1921. 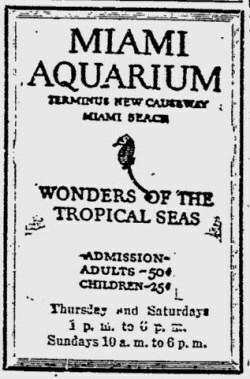 Ad in the Miami News in 1921 shortly after the opening of The Aquarium. As planned, The Aquarium opened for business on New Year’s Day of 1921. As visitors approached the building, they were greeted by a uniquely designed building. The exterior had a soft gray exterior appearance with brightly colored Moravian Pottery tile. The window and door trim were painted to complement the colors of the tile. On the walls, there were water color paintings provided by a Japanese painter. On either side of the front entrance were mounted fish: a marlin on one side and a tuna on the other. The corridors were laid out like a Maltese cross. Along the walls of the corridors were fifty exhibition tanks that were illuminated with natural lighting. One of the glass fronted tanks was possibly the largest in the world at the time, with measurements of 36 feet long, 15 feet wide and 10 feet deep. It could hold fish up to 12 feet in length. For many visitors, the Aquarium was the first exposure to tropical fish. Some visitors may have visited other aquariums in Boston, New York or Detroit, but there was nothing like the fish found in Miami. The only fish on display in the Aquarium were caught within 50 miles of Miami Beach. Parts of the Aquarium facilities were designed to attract researchers to study tropical fish. One focus of the research conducted was on the propagation of spiny lobster and large stone crabs. Stone Crabs were widely available in the seas surrounding Miami Beach. Unfortunately, many believe the stone crab not to be edible because it possessed so much iodine, making the flavor unappealing to most people. 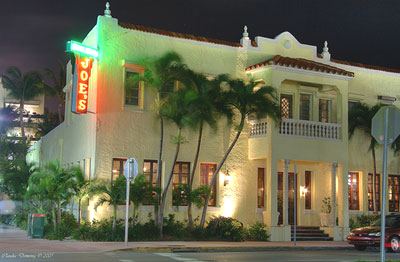 One of the most popular places to eat fresh seafood on Miami Beach was Joe’s Diner. Joe was continually trying to find a way to cook stone crabs so that it was appealing to his patrons. It was a Harvard researcher from the Aquarium that informed Joe of the excess iodine in the stone crab claws, causing the taste to be unappealing. Together, Joe and the researcher decided to boil and chill the stone crab claws. The boiling removed the iodine and the result became a very popular dish at Joe’s Diner. Years later the restaurant changed its name to Joe’s Stone Crabs and today many South Floridian’s anxiously await the opening of the restaurant for stone crab season. If it weren’t for the Aquarium, Joe may never have figured out the best way to prepare stone crabs and the course of culinary history may have completely changed for one of Miami Beach’s most famous restaurants. By April of 1921, prohibition was in effect for over a year. The south east corner of Florida was problematic for prohibition enforcement given its proximity to the Bahamas and Cuba. It was very easy to conceal cases of alcohol in the hulls of boats arriving from both locations. There were plenty of places to conceal ones cache of liquor. James Allison, like many of the wealthy that had homes in South Florida, had a personal stash of liquor. He got word by his friend Jack LaGorce that the feds were poking around on Miami Beach looking around and trying to get a line on any information that would lead to the discovery of hidden caverns of alcohol. It had been rumored that Allison had a secret stash of liquor at The Aquarium. On April 27th in 1921, Dade County Sheriff Louis A. Allen secured a search warrant from Judge W. Frank Blanton. Two sheriffs went to The Aquarium, with warrant in hand, and began to search the tower, water tanks and Allison’s private yacht. Despite what they thought was good information on the location of Allison’s private stash, they were not able to find anything. As they were leaving the premises, five federal agents arrived, with the mission of searching the premises. As the federal agents approached, they asked the sheriffs if they were searching for the hidden stash. The sheriffs confirmed they were, and the federal agents said “come with us and we will show you were it is”. Article in Miami News in 1921 of the Liquor Raid by Federal Prohibition Officers. With the assistance of information from a former employee of Allison, the group went directly to Allison’s apartment on the second floor of The Aquarium building. The feds took a hatchet to a plastered wall where they found an iron door. Upon opening the door, they discovered the liquor. At the end of the raid, the feds confiscated 2400 bottles of liquor. After listing the inventory of alcohol, the feds destroyed the cache, with exception of enough to represent evidence. It was very rare when the wealthy suffered the wrath of prosecution. At the end of the ordeal, Allison was fined $500 and lost his entire stash. Prosecution was reserved for those who could not defend themselves such as the poor, the illiterate and immigrants. Although his liquor was confiscated from The Aquarium in April of 1921, Allison continued to have a supply of alcohol throughout prohibition. By the end of the 1922 – 1923 winter season, The Aquarium had approximately 110,000 visitors over the course of its three years in existence. Despite the popularity of Miami Beach’s early tourist attraction, it was losing money well beyond Allison’s expectations. It was estimated that losses during the 1922 -1923 season was 10 percent higher than the prior year’s losses. Article in the Miami News in 1923. The Aquarium received lots of press attention and all of the key business leaders and politicians credited this establishment as a necessary attraction not only for Miami Beach, but for the entire State of Florida. However, Allison could not reconcile continuing to finance an institution with exorbitant hidden costs. Allison conveyed to Carl Fisher that he could not continue to finance the losses and that he was seriously considering closing The Aquarium. Fisher understood the value of a world class tourist attraction and tried to convince Allison to reconsider. It was considered so important to South Florida that both the Miami City Commission and Miami Beach City Council strongly considered to “help make up the yearly deficits”. When Allison announced that he was going to close the Aquarium, many community leaders and civic organizations got involved. The Kiwanis Club put forth the idea of raising the mileage rate a half a percent and the Rotary Club suggested forming an Aquarium Association to raise money. A variety of organizations met with the County Commissioners to provide support for the Kiwanis Club idea of raising the mileage rate. The County Commissioners voted not to raise the mileage rate, an act that finalized Allison’s decision to close the three year old Aquarium. Allison arranged for some of the fish to be distributed to the Detroit Aquarium and others to be returned to the warm waters of the Caribbean. When the Aquarium was dismantled for the construction of a hotel, Allison had the special glass and the pumps donated to the City of Miami in the event they decided to build another aquarium. Article in Miami News in 1927. It didn’t take long for the donated equipment from The Aquarium to find a home. In December of 1927, the Miami News reported that W.K. 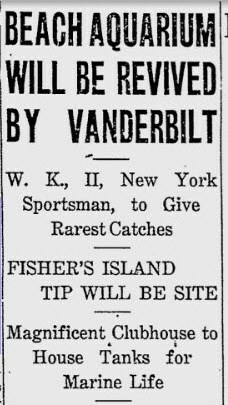 Vanderbilt was planning on adding an aquarium in the clubhouse of his home on Fisher Island. The article implied that some of the equipment from The Aquarium would be used in the building of Vanderbilt’s aquarium. Once the Prinz Valdemar was reclaimed from Biscayne Bay and hoisted onto land in 1928, it served a variety of roles including an officer’s club during World War II. Following the war, the land based ship hosted an aquarium as well as a restaurant along Biscayne Boulevard near today’s American Airlines Arena. Following the dismantling of the Prinz Valdemar in December of 1952, the next public aquarium in Miami was the Seaquarium on Virginia Key in 1955. When it opened it was considered the largest marine-life attraction in the world. From 1963 through 1967 it was the home to the filming of the show “Flipper”. The park attracts more than 500,000 visitors per year. In addition, the new Science Museum in Museum Park will feature a large aquarium as part of the museum when it opens in 2015. Following the sale of the land formerly occupied by The Aquarium, it became the Floridian Hotel in 1924. Not only was it in an enviable location, but it was a very elegant high end hotel for the day. After WWII, it evolved into one of Miami Beach’s first retirement hotels. The hotel was later renamed to Biscaya and it was torn down in March of 1987. The same land is now the home of the Bentley Bay Condominiums that was built in 2005. Once James Allison rid himself of his preoccupation with The Aquarium, he was free to focus on other projects on Miami Beach. Given his health issues, he felt that Miami Beach needed a world renowned hospital that catered to the many wealthy visitors. Allison Hospital became his next big project. Miami News: “When the Aquarium Went Under”, June 11th, 1988 by Howard Kleinberg. 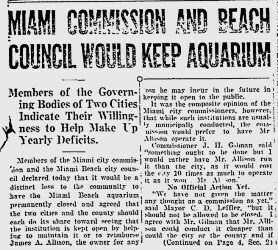 Miami News: “Beach Aquarium Will Be Revived by Vanderbilt”, December 4th, 1927. 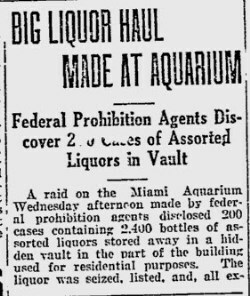 Miami News: “Big Liquor Haul Made at Aquarium”, April 28th, 1921. National Geographic: “Treasure-House of the Gulf Stream”, January 1921. 3 Comments on "The Aquarium – An Early Miami Beach Tourist Attraction"
You have written there nicely about the Miami Beach Aquarium and The Flamingo Hotel. Although I visited this city two times but I never get a chance to stay at The Flamingo Hotel. I am going there again after my thanksgiving tours. This time I will visit its all attractive places to have a great time there including this hotel and Aquarium. This is amazing. I’d done some research on the aquarium myself, but you’ve finished it all for me! I wish that all of Miami Beach’s original buildings were still here. So sad that they’ve been replaced with what we have now.